Tricky to say this one. Came-em-bert (as in the name Bert) is not right. Cam-em-ber is probably as good a description of its pronunciation as we’ll manage. The key is, you don’t say the ‘t’ at the end. It might get a bit confusing though if you’re a guy called Bert (saying the ‘t’) eating Camembert (without the ‘t’). Anyway, however you say it, it’s a regular dinner thing in our house – we love it and we hope you will too. Camembert is a French cheese. It’s creamy in the middle with a white outside edge that’s a bit ‘chalky’. It’s sort of goo-ey and soft and just flipping delicious. It was first made in a town called…Camembert in the area of Normandy in Northern France about 200 years ago (so quite a long ago and definitely WAY before the invention of Cheese Strings and Dairylea then). What’s quite unusual about Camembert is the way it’s wrapped up and sold. Normally most cheeses are put into some sort of plasticky, waxy wrapping whereas Camembert is sold in a little round wooden box. The boxes are quite useful for one of our recipes (see below). Clearly, it’s going to be in the cheese section. 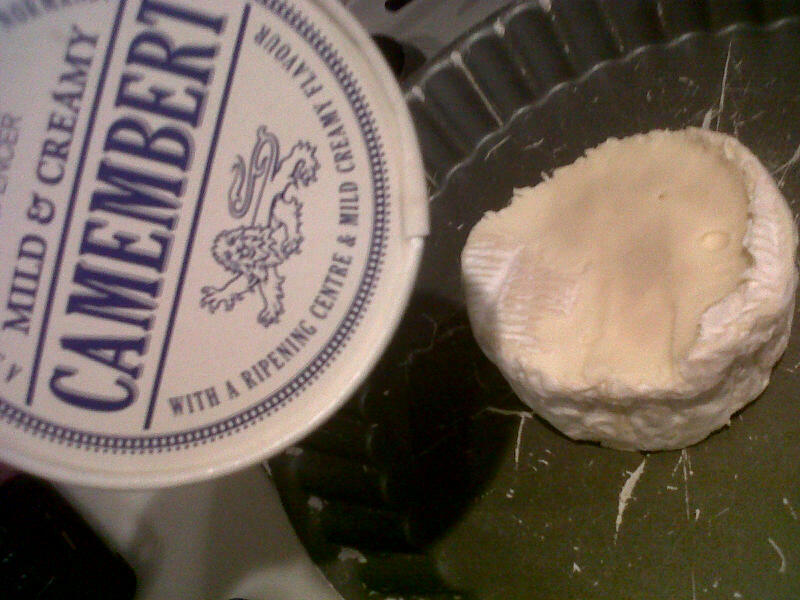 Note to parents: you’re best to stick with a pasteurised milk Camembert given your children are eating it. The main big brands such as President and Le Rustique are pasteurised. Well like most cheese, you can eat it on its own with bread or crackers but it’s also sometimes baked or added as an ingredient to recipes…talking of which…here are our recipes! This is absolutely fab! It’s so easy that we made the ‘recipe’ up but to be honest, we’re not sure it really counts as a recipe. Take one Camembert round out of the box but keep the box. Discard any plastic wrapping. Put the oven on (well get your grown-up to do this depending on how old you are) – about 200degrees C.
If you have one of those olive oil sprays, spray a bit of this on the top. If not drizzle about a teaspoon worth from the bottle onto the cheese. 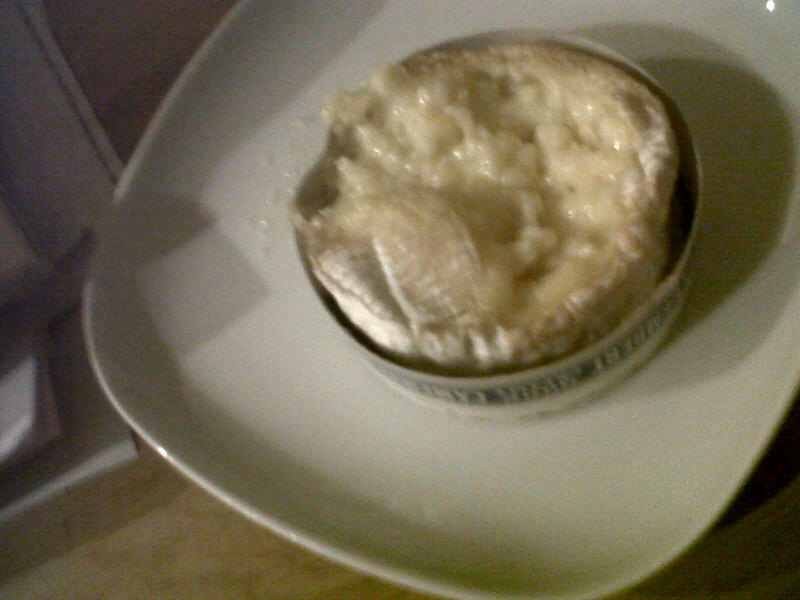 Then bake your Camembert for about ten to fifteen minutes. If you’re feeling a little adventurous, you could squish a clove of garlic and some sprigs of thyme in the top before baking it. Once it’s done, take a little care initially as the melted cheese could be really hot. Serve it with lovely fresh crusty bread which you can all dip inside the cheese. If you’re a bit cheeky, you could tip a spoonful or two of the melty cheese into your soup if you have some. YUM!!! If you liked it, check this recipe out- it takes mushrooms and a few other bits and pieces and adds camembert slices. It’s not going to be your main dinner of the day on its own but could make a good family lunch or smaller supper. Note: parents of more cautious kids could leave out the coriander.